The boss of PCA, Martin Tomasek, prepared a great party for the employees to get to know each other better. Recently PCA has increased its number of employees and this party was a great oportunity to introduce them to the rest of the PCA family. 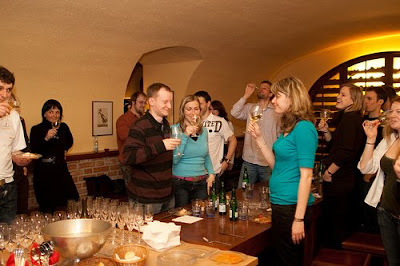 Party was held in Wine club Monarch. When I walked through the streets of Prague towards Monarch that evening, I was full of expectations. And then when I reached my destination all of my expectations were fulfilled, even outdone. 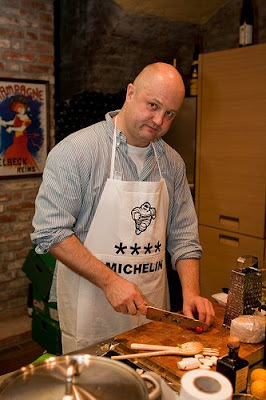 I was shocked when I saw my boss wearing an apron with four stars of Michelin and cooking for all of us. 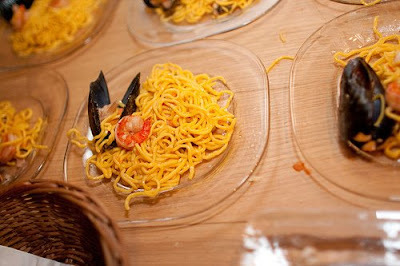 The funny point is that the best restaurants awarded by Michelin stars can only reach three stars at maximum but Mr. Tomasek had to have four stars of Michelin. I think he looks better with an apron then in a suit, doesn't he? After a while I recognized his helper, our IT master (Martin) who was wearing just three stars of Michelin; nevertheless, without him we would eat at 2 am. The main cook was a little bit slower. To complete the picture of our management, Ivana took place next to them, as she was the main advisor and the guide through the party. 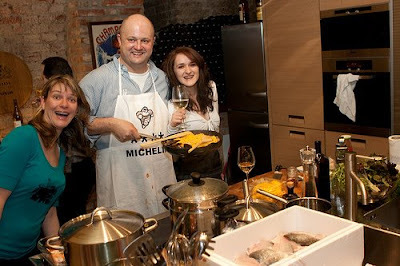 Our management: now guess who is the boss of the kitchen? Great wine was chosen for our drinks and thanks to this liquid the evening went much faster than I expected.We did big cheers to our boss and since then we were cheering as much as we can. Because the wine was great and, moreover, it was free. Very suprising point was meal. Most of us were expecting cold kitchen but MT and his group came with "foreign" cuisines. The entire menu consisted of nine meals! The time schedule was one meal per hour. The meal was delicious. Later we discovered why the meals were so delayed. We found that MT was chatting with the receptionists and he didn't have time to cook. Evidently, he didn't that much of an interest to feed the male part of the company. The party was brilliant at least from my point of view. I am including a few more pictures at the end. I hope the next party will exceed my expectation as well. I have created new flash game from Prague. Today, I would like to show you front view of residence Karolina. The aim of this paper is to provide a brief insight into world of tourism, especially of accommodation with regards to financial crisis. Today’s financial problems are influencing the whole world. A lot of companies are on the border of bankruptcy, others already have bankrupted; unemployment rate is increasing, money is being withdrawn from the banks accounts and these aspects also influence the sector of tourism. The world of travel is changing. Next one and or two years travel business will be influenced by financial crisis. There is no doubt about reducing family budgets. It makes sense that first what is going to be reduced are holidays, vacations or trips. tIhere is no wonder that according to report of PWC hotels are managing in a downturn. Niels Pedersen Managing Director (Supranational Hotels, November 2008) stated: “In 2009 hotel revenues typically will drop 20 per cent, with the five-star market hardest hit, four star properties down by a quarter, three stars dropping 10-15 per cent, and budget hotels remaining static”. A top executive with an international luxury hotel chain, who did not want his name used for fear of losing his job, stated recently that the dominoes are falling among full-service hotels frequented by business travellers in London, Tokyo, Hong Kong, Shanghai, Paris, Prague and even New York. Until recently, hotel rates in New York were buoyed by robust demand by financial services executives and by foreigners lured by a favorable exchange rate (stated in The New York Times, November 2008). What will be the impact of financial crisis on accommodation services? What will be the reaction of travellers to financial crisis with regards to accommodation? What will be the reaction of accommodation providers? The solution will be placed on the shoulders of accommodation providers. Travellers are searching for better offers. Travellers will be forced to stay longer with searching for offers because spending money will be more careful than before and travellers will require the same quality for lower price. It can be seen as two different approaches; however it is crucial to take into the account that in these times, people will think in the way of; if I am going to spend certain amount of money I would like to have appropriate accommodation for it. Moreover the travellers will be looking for other types of accommodation as an alternative of hotels. From this point of view the financial crises can be more profitable for alternative accommodation in comparison of hotel. As I stated; travellers will try to find same value or quality instead of hotel. Therefore types of accommodation as apartments, bed&breakfast, hostels, pensions, hospitality exchange and so on may benefit from from increasing interest in other types of accommodation. However it is necessary to be aware of impact of financial crisis also for these alternative types of accommodation. Without regards to accommodation types, what can an accommodation provider do with degreasing demand. "There's [been] nothing like this in history, in terms of falling demand" says Bjorn Hanson an industry analyst with New York University's hotel school (Time.com, 2008). I have succeeded in finding some examples, how hotels are dealing with degreasing demand. “One is to cut services — closing gyms, shutting business centers earlier and no more 24-hour room service. Of course, this is easier for mid-price hotels to cut than luxury hotels, where customers expect a certain level of service. One option most are rejecting is reducing the overall room rates, because hotels feel they got burned doing that in 2001. "They found that the math doesn't work," says Yesawich, CEO of Y Partnership, and a travel industry consultant; "you have to book too many more rooms to make up the lost revenue." What they are doing this time around is offering promotions and upgrades: Fairmont is offering third night free and $100 gift cards. Discreet discounts, on the other hand, are all the rage. Priceline, for example is expanding its roster of top-flight inns. "Hotels that we've wanted for a long time, like five-star hotels, are coming in," says Chris Soder, president of North American travel. Yesawich explains that hotels are taking a portion of their inventory, maybe 20 to 50 rooms, and selectively discounting them in this opaque way. "Even a modest rate is better than no rate at all." (Time.com, 2008). One group of traveller can benefit from such situation – business travellers. Due to decreasing prices for hotels their position as customers is improving. Hotels are directly bargaining with corporate travel managers, offering lower room rates than in the past, "I'm hearing that they're doing better in negotiating with hotel pricing," says Caleb Tiller of the National Business Travel Association (Time.com, 2008). Corporate managers are also in a good position to negotiate with hotels for add-ons, like free Wi-Fi, gym use and breakfast. And finally we are getting to marketing and other investments. “Many hotel businesses will be tempted to freeze infrastructure investments, mothball new growth hotel projects and defer integrating the latest acquisition. Advertising and recruiting investments are easily cut, as are loyalty programmes for customers and staff. 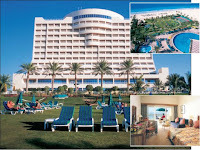 However, some hotel businesses will take a different approach and selectively invest where others are cutting back. These are the businesses that will benefit“ (hotelmarketing.com, 2008). From this point of view there are easy to cut marketing costs and investments opportunities, however, if you do this you can lost your way, how to recover from nowadays situation. Another output of these statements is to get closer to customer. Continue investing in relationship or leverage new media are two of many topics by Dorothy Dowling (hsmaieconnect.org, 2008). Very popular approach is social marketing. Sites such as blogs, forum, facebook, myspace and so on are really worth to travel companies. Let me conclude this article. I hope it doesn’t sound too ambitious - Travellers are likely to cancel their trips and accommodation providers are more than aware of it. Therefore their prices are falling, services are upgrading, other types of accommodation are available, more benefits are offered and etc. In my opinion travellers don’t need to cancel their trip, they need to open their. And the oversupply is very favourable for travellers. Maybe in two years when the world will recover from the crisis these benefits or options will be reduced. From the point of accommodation provider I can say that the fight for customers will be harder than ever before. It is crucial to convince travellers to travel, because it is worth for them. So my point is not to reduce marketing or investments but completely another approach – get closer to the customers. It is essential to be seen by travellers. Other point is to deliver added value to customers. Because world of mouth (social marketing) is very powerful tool for today’s marketers. 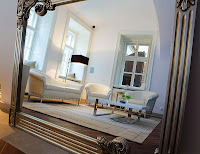 Welcome back to our new part of Prague in the past and today by Prague City Apartments. Today, we are going to explore Charles Bridge. 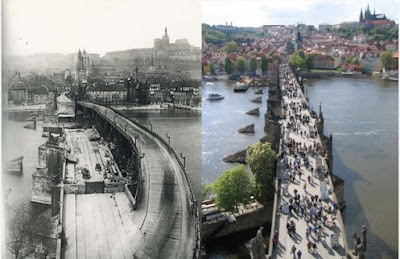 In the beginning of the 20th century, Charles Bridge saw a steep rise of heavy traffic. The 15 May 1905 was the last day of the horse-line on the bridge, as it was replaced with an electric tram until 1908 and with buses afterward. 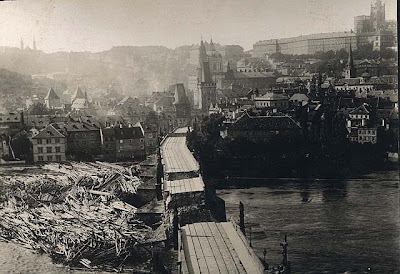 On 2-5 September 1890, disastrous flood struck Prague and severely damaged the Charles Bridge. Thousands of rafts, logs and other floating material that escaped from places upstream gradually formed a huge barrier leaning against the bridge. Three arches were torn down from the great pressure and two pillars collapsed from being undermined by the water, while others were partly damaged. With the fifth pillar, two statues - St. Ignatius of Loyola and St. Xavier, both by Ferdinand Brokoff - also fell into the river (the former statue was replaced by a statuary of Cyril and Methodius by Karel Dvořák, the latter was replaced by a replica of the original). Repair works lasted for two years (the bridge was reopened on 19 November 1892) and cost 665,000 crowns. From Charles Bridge visitors enjoy fairytale views of the Prague skyline. The wide expanse of the river flows beneath it, flanked on both sides by elegant buildings. Prague Castle towers above in its eminent position. Here you are truly in the centre of the city. Charles Bridge throngs with people during the day. Street artists sketch and musicians play; look out for the jazz band, who are particularly entertaining. But for a truly romantic and less crowded stroll, try early morning or any time in the evening. I hope you have enjoyed our tour to Charles Bridge and its past and stay tunned for next batch of pictures Prague in the past and today. Czech EU presidency is backgrounded by many interesting culture events. Therefore, I would like to present one of them. In these days Musical Theatre Festival in Prague is running. The OPERA Musical Theatre Festival is a festival of representative performances of Czech and Moravian professional opera ensembles complemented by independent opera projects. Once in two years, Prague becomes the place where one can see the best of the Czech opera theatres – the performances take place in particular on prestigious Prague opera stages (historical building of the National Theatre, the Estates Theatre, the Prague State Opera). The festival confronts on a regular basis both the direction of and level of individual ensembles and extends the range of opera offer in Prague - offering plays that have not been performed in Prague for decades (or even not performed at all) and also a different view of the plays that are currently staged in Prague theatres. It also presents remarkable personalities (directors, conductors, performers) from regional theatres.